If you buy squash seeds each year, you can plant any and all types of squash. The seeds you plant should be true to type and you should harvest the type of squash that you planted. However, if you plan to collect seeds from your own squash harvest to plant in years to come and you want true to type plants for future years, you have to be mindful of the fact that squash easily cross pollinate ... if you aren't careful, you can end up with all sorts of squash hybrids growing from your seeds rather than true to type squash. Just look at the weird squash hybrids growing in my garden right now (photo above). This year, I planted all kinds of squash varieties and didn't pay the slightest bit of attention to their species or think about cross pollination. I also ended up receiving squash seeds from a reputable seed vendor that were not true to type and unknowingly planted some hybrids (I have no way of knowing what types of squash they might have come from). Some of my squash reseeded itself late in the summer and I just let those plants grow. Although some of those late plants have given me true to type squash (sweet dumpling and acorn), the majority of the fruit have been crazy hybrids. Now, that's not necessarily a problem. There isn't really anything WRONG with hybrid squash -- most taste pretty good and you might end up with something really interesting too. However, if you want to grow a particular type of squash from seeds you've collected yourself, you need to do a bit of planning and/or hand pollinate your squash. Otherwise, you might be in for a surprise! Squash belongs to the genus 'Cucurbita'. The Cucurbita genus is generally known as the gourd family of plants and includes squash, pumpkins, and gourds. Within the Cucurbita genus, there are four species which are commonly grown as annuals: Cucurbita mixta, Cucurbita maxima, Cucurbita moschata, and Cucurbita pepo. 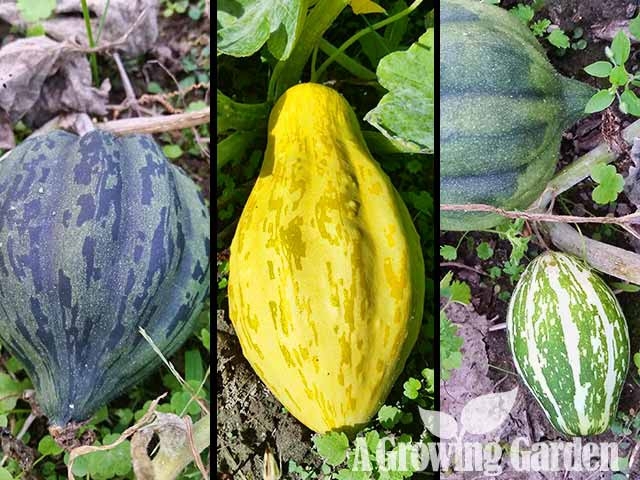 Now, here's the important part about growing squash in order to produce "true to type" seeds .... while squash varieties within each species will readily cross pollinate with each other, separate squash species do not cross pollinate. So, that means that if you want to be sure that any squash you harvest for seeds will produce a "true to type" squash plant next year and you don't want to hand pollinate your squash, you can only plant one type of squash from within each of the four main squash species. To give you an example of how you could grow squash to ensure harvesting true to type seeds, you could plant a common cushaw, hubbard, butternut, and acorn squash (one variety from each of the four squash species above) and be sure that they will not cross pollinate and that the seeds you collect will be true to type. However, if you were to plant acorn, delicata, and crookneck squash (all of which belong to the same C.pepo species), those plants could cross pollinate between themselves and the seeds you collect could potentially be hybrids and not true to type. So, as much as I'd like to grow a little bit of everything, I've decided to narrow down the number of different types of squash I plant next year to just one variety from each of the four species of squash and I'll probably start with purchased seeds ... just to be sure I start with true to type seeds. Of course, I have yet to decide which varieties I will choose ... that's going to be a tough decision! We have crooknecks and spaghetti squash together and one of the crookneck plants had 2 large sqush on it that are the shape of the spaghetti squash all the rest are long and skinny. Do you think they got cross pollinated? Awesome helpful article! Easy to understand and NOW I know to be sure NOT to plant my Tromboncino squash near the Delicata squash. I also love to grow Butternut and glad to read I should not have problems where I plant this this year. This is a great article to print and bookmark -so glad I found it!